The act of taunting can be learned by observation and improvisation. It usually follows linear thought, correlating or building in some manner to the target of taunting. Things such as the victim's appearance, intelligence, mannerisms, education, background, past offences, etc. can otherwise be insulted. When used in this manner, the effectiveness of a taunt at provoking a response varies depending on how the specific insult relates to its victim (or their sense of self), to what level of offence they regard the taunt, and how well the victim can control their emotions when responding. Uhmmmm, yeah.... I've this feeling that you have one hand tied behind your back, and I stand like the Black Knight on only one leg. 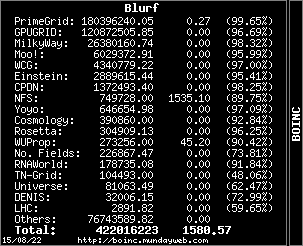 If (and when), you pull out that other hand for the Boinc programs, I will be left choking on my own con-trail and only my teeth nipping at your kneecaps. Server? WHAT new Server? Oh THIS? 16 Cores? Not counting the GPU? Lotta kNI!ggts on this list I never chatted with... Somebody ask them to drop by the Fortress! Just a few weeks and I overtake ya! Waitaminnit!! Who is that in my Rear View? Plomos?!? Based on RAC, KWSN-HoC better pay attention!